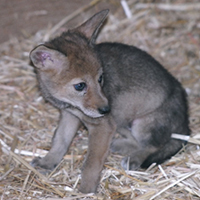 The first time my coyote spoke to me, I was about six, sleeping all happily as I did then, dreaming of cartoon space ships and moving sidewalks and ocean tsunamis washing up over the shore and sweeping away my house. Sometimes when I had tsunami dreams, I’d see black swirls for an hour or two after I wake up. But that’s not what happened that night. That night, there was a little voice in my ear. Maybe the voice was in my brain. Or in my dream ear. But it said, “Henry.” Just like that. I woke up to see if my Mami or Papi was in the room and calling me but no. I stepped outside to see if it was the wind chattering through the palm fronds, but the velvet night was super still, with just a faraway train whistle. I felt unreal, like I was in a movie. But I was only in my underwear in my backyard. I listened for the voice all the next day, which was just a stupid boring Friday at school. A pop quiz here, a sock in the back when you walk down the hall there. I spent Saturday in my suit of armor, jumping over the moat, pulling the drawbridge up and down, and storming the castle walls, hoping to hear my name all the while. But it never came. And still it bugged me the next day when we went for a picnic in the park, which is what we always did on Sundays back then. We hiked up into the dry Hollywood Hills behind Griffith Park, and stared out across the AstroTurf-looking golf course with its toy golfers, past the black licorice freeway with its Matchbox cars, toward the mountains, which were either blurred by beige smog or diamond clear and sugar-sprinkled with snow but never at the same time. I made my parents hike to the top of the mountain that day, on a trail we never hiked before. Mami kept saying, Are we lost yet? Are we lost yet? Papi put his arms around her waist and tickled her, saying, Is it lunch yet? Is it lunch yet? Idiota, Mami said, laughing like a tropical bird. Chingadulce, he said back, and grabbed her bottom. I always felt happy and safe when they played together like that, so I ran up ahead to see what was calling me from the top. I pushed through some small trees and what I saw practically paralyzed me. A young mountain lion, a magnificent creature, had cornered a coyote pup against a tree. All taut muscle and blood mustache, the cat was toying with her dessert, savoring the last of her brunch, as evidenced by the big bones and matted fur and entrails of wrecked pup appetizers scattered about. She looked up at me with gold eyes for no more than a second, then flashed away into the brush and was gone, like she was never there. Leaving a big mess behind. The coyote pup whimpered and I heard my name. “Thank you, Henry,” it said. Pure and loud in my ear, just like before.